Lexicalization, a process of language change, has been conceptualized in a variety of ways. Broadly defined as the adoption of concepts into the lexicon, it has been viewed by syntacticians as the reverse process of grammaticalization, by morphologists as a routine process of word-formation, and by semanticists as the development of concrete meanings. 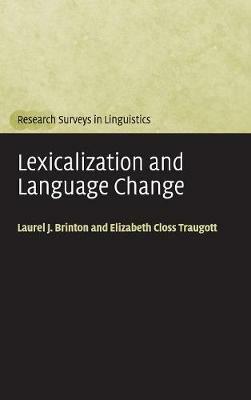 In this up-to-date survey, Laurel Brinton and Elizabeth Traugott examine the various conceptualizations of lexicalization that have been presented in the literature. In light of contemporary work on grammaticalization, they then propose a new, unified model of lexicalization and grammaticalization. Their approach is illustrated with a variety of case studies from the history of English, including present participles, multi-word verbs, adverbs, and discourse markers, as well as some examples from other Indo-European languages. The first review of the various approaches to lexicalization, this book will be invaluable to students and scholars of historical linguistics and language change.